Wicklow County Council 2016 Steering Group has worked together to produce an ambitious programme to commemorate the events of Easter 1916 in a respectful and sensitive manner. This programme follows consultation with the public, including open community workshops and a call for the public to submit their projects and ideas for grant aid support. These have been received and assessed. In addition, Wicklow County Council 2016 Steering Group is also developing projects which will form a central part of the upcoming calendar of events. 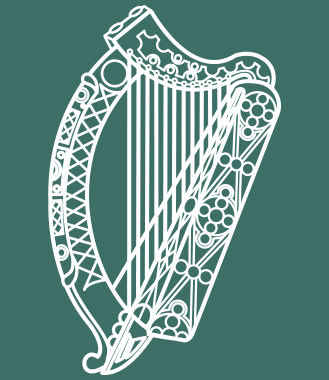 All projects are within the framework of the strands which embrace “Ireland 2016” nationally. The app 1916WicklowLife is now available to download free of charge for android phones or tablets from Google Play and on iPhones or iPads from the App Store. The website version of the app can be found on 1916wicklowlife.ie. Createschool proudly presents a Two Chimneys Production of "Freedom - A 1916 Story". This 10 & 1/2 minute stop motion film tells a story of the Easter Rising in Dublin in 1916. Commissioned by Wicklow County Council as part of their 1916 : 2016 Commemoration programme. Historian Pat Liddy was on hand to ensure historical accuracy and also lent his voice to the main character. Renowned singer songwriter Leslie Dowdall helped write a song for the film - "Time To Be' that features on the opening credits. Feagh MacHugh of the Mountain,Feagh MacHugh of the Glen -Who has not heard of the Glenmalure chief and the feats of his hard-riding men? 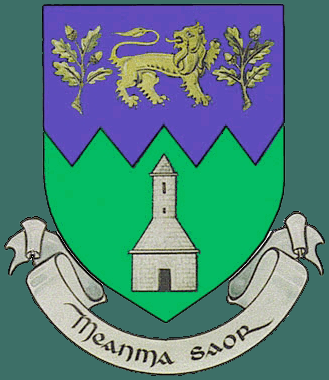 The Military Road, stretching from Rathfarnham to Aghavannagh, which crosses the mountains, north to south, was built by the British army to assist them in defeating the rebels still active in the Wicklow Mountains following the 1798 rebellion. It provided them with access to an area that had been a hotbed of Irish rebellion for centuries. This tradition continued into the 20th century. "...we saw the Flag being hoisted over the roof, and Mr. Pearse standing on the street outside. It seemed almost impossible..."
James MacSweeney(1) states that “following a meeting in the Rotunda Gardens, Dublin, in November 1913, to organise the Irish Volunteers where addresses were delivered by leaders, notably P. H. Pearse, the first company of this organisation was formed in Bray”. The Howth and Kilcoole gun running of summer 2014 increased interest and numbers in the movement. A split in the Irish Volunteers in November 1914, depleted numbers loyal to the original Volunteers. The cancellation of the Rising, originally set for Easter Sunday, led to some confusion. 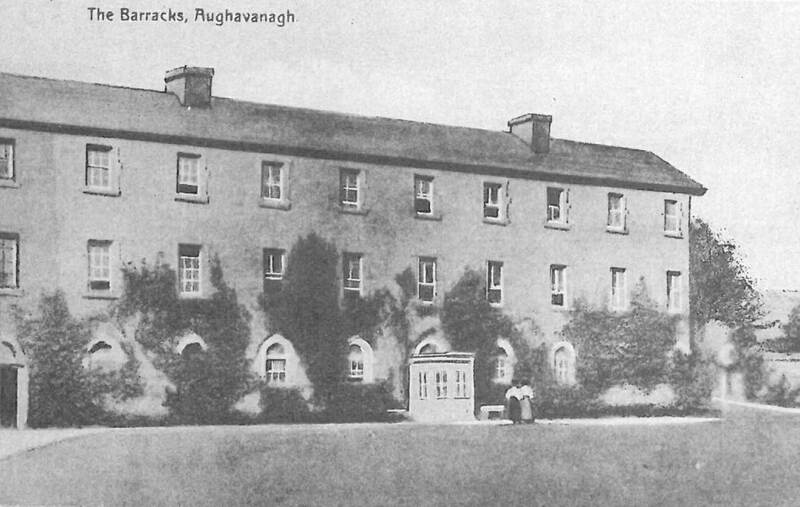 As a result, the Bray Company took no official part in the rising, other than cutting telephone lines in the town. Two of its members did, however, take part in the fight – Stephen (Steenie) Mulvey and Tom Sutton. The former managed to get to the GPO and fought there from Tuesday to its surrender. Desmond Fitzgerald gives a detailed, first hand account(2) of his involvement with the Irish Volunteers. In early 1915, Fitzgerald was sent from Kerry to north east county Wicklow, with responsibility of enrolling and training Irish Volunteer recruits from that area. 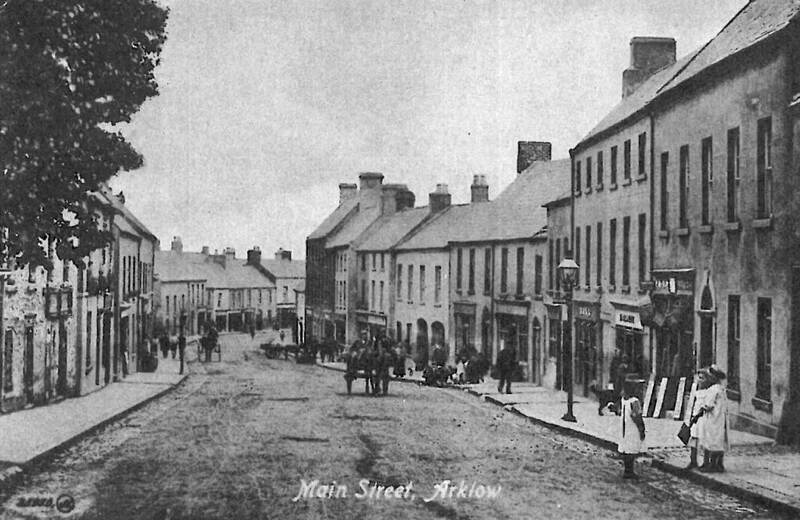 He states “Wicklow county from Bray, to within twenty miles of Arklow post office was open to me”. Fitzgerald, on moving to Bray, recounts his direct dealings with Arthur Griffith, The O’Rahilly, Cathal Brugha, and Eoin MacNeill. He recalls: “ As we approached the post office, we saw the Flag being hoisted over the roof, and Mr. Pearse standing on the street outside. It seemed almost impossible that this should really have happened. I said to my wife “this is worth being wiped out for”. .. As my wife and I hurried forward, Pearse saw me and came towards me with a welcome. He looked rather graver than usual. I felt that while he had something of elation there was also a heavy sense of responsibility. He told me that O’Rahilly was in the post office, that he was in charge of one side of the top part, and he appointed me O’Rahilly’s adjutant”. 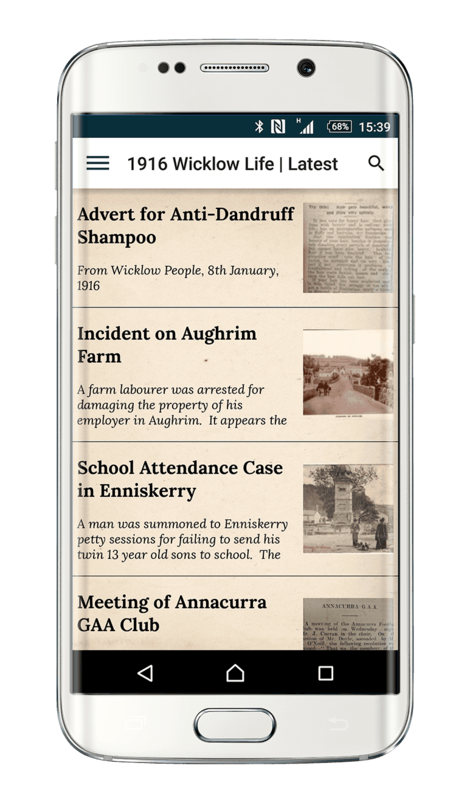 Development of a Downloadable app 1916WicklowLife which will feature extracts from the county Wicklow newspapers – “The Wicklow people” and “The Wicklow Newsletter”. 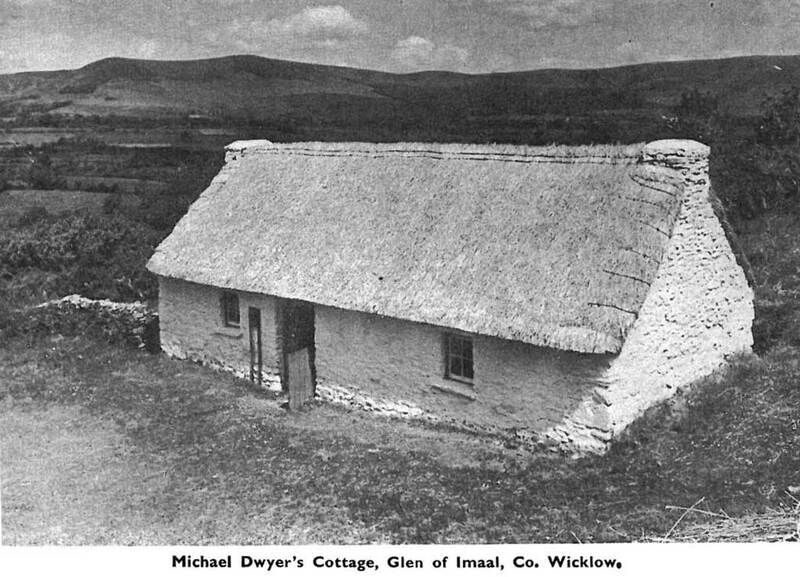 Extracts will include articles about events in Wicklow, as well as advertisements and personal ads. From January 2016, users will receive weekly updates on the newspapers from 100 years ago. Following the Rising, granite from McEvoy’s quarry in Ballyknockan was used to rebuild the GPO. This will be honoured in an oral history of Lacken, Ballyknockan and Valleymount. “Words to the Wind” will give 1916 contemporary relevance which will appeal to young people. This involves the production of an animated film incorporating a combination of handmade sets, lego minifigures and technology based on the key events of 1916. The film will be distributed to all primary schools in county Wicklow.